When I lived in the flat, I was a little naive in thinking I was safe, luckily I never did get burgled but I could never say never. I did feel more secure at the flat due to the closeness of my neighbours and due to the security systems on the main entrance and exit doors. Living in a house however is a whole different story, I constantly go around checking the windows and doors are locked and securely shut. I know it doesn't give me 100% protection from sad low life thieves, however if I can help prevent a break in then I sure am going too. Living in a house means we have two doors, the front and the back, unlike we did at the flat as we only had one door, we also lived on the first floor, meaning none of our windows was ground floor, obviously at the house this is a different story. Our kitchen, lounge, and bathroom is all down stairs, with our bedrooms upstairs. 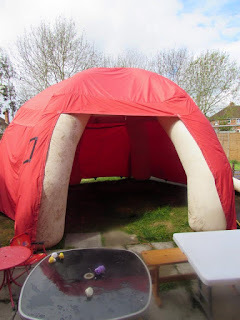 We've such a big garden, we was able to fit a disco dome in it and still have lots and lots of room! We also have the garden, something we never had before and something you don't need to think of, or least I didn't have to think of living in my flat as there was no communal garden. At the house though we do have a garden, and a very, very large garden! With a large garden comes lots of items, two standard size tables and chairs, a child's patio table set, a gas bbq, lots of other garden furniture and lots of children's play items including a swing set, a sand pit, a child's gazebo, a water table and much more! Having a garden fence around the whole garden doesn't really ensure safety from thieves, neither does a gate, however we do have quite a large gate with a few garden gate locks on there for extra security. We've not yet had time or the money to buy a shed for our lawn mower, strimmer and other garden tools, so the locks are quite important for us! 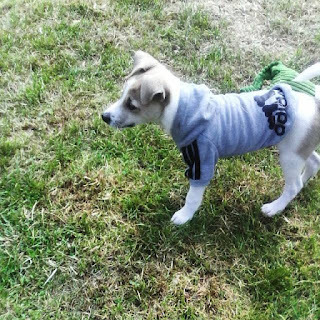 Our puppy dog, when he was small, now he's a giant and he's still only a pup! We've also got a puppy dog, but when I think of the puppy dog going for a intruder, I worry about him like he's my child! When Gareth's over I feel a lot safer, but when he isn't there, I'm thankful for all the security measures I have in place! Is there anything you have in place that makes you feel extra secure? I'm thinking about cctv cameras next! Everyone says I worry too much, but its better to be safe then sorry isn't it!